Issued 25th October 1932. These 40f revenue stamps were needed for the issue of a valid wedding certificate. The heading on the stamp illustrated essentially means 大滿州國雙喜印花 Great Manchukuo double happiness stamp. 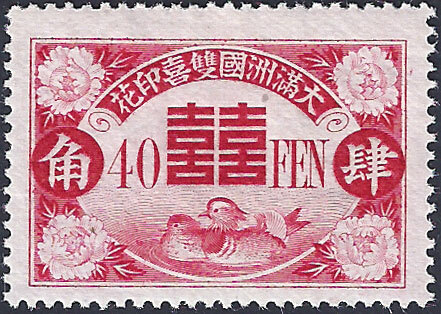 These stamps replaced the former Great Wall revenues which simply had the Double Happiness symbol as an overprint. Barefoot lists these stamps stating that the early version is red and the later version is red/brown, in fact the reverse is true. Perf 13½ x 13. Size 32mm x 21.5mm. Printed on plain white paper. The design features two mandarin ducks and the symbol for Double Happiness 喜喜. 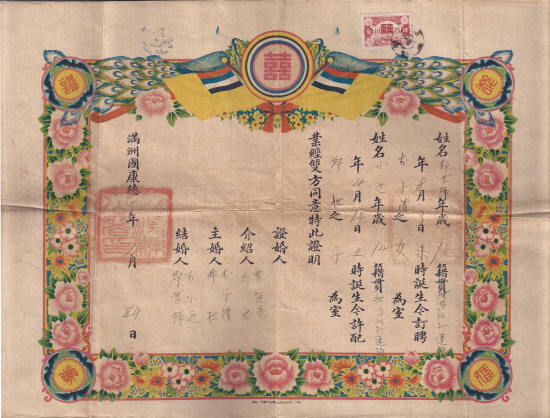 Example of a Manchukuo Marriage Certificate from the Datong period. 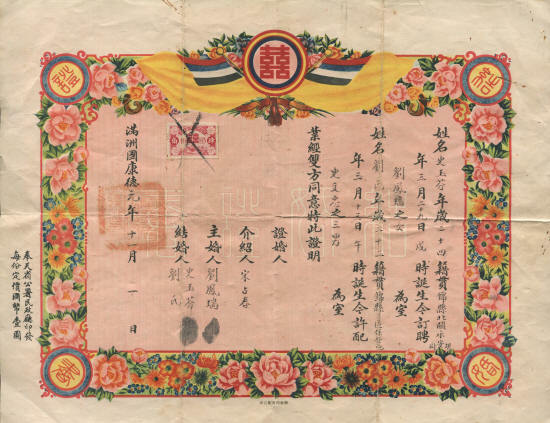 The wedding certificates were large documents 350mm x 250mm and very colourful as you can see. The example shown has an imprint 奉天-股份有限公司兴亚印刷局-印刷 Fengtian - Limited Co. Printing Office - Printing. This is a second example produced by a different printing company with some design changes. Note that the bride and groom both applied their thumbprints as a means of signing the certificate. Issued 13th July 1934. This is a revised issue needed when Manchukuo became an "Empire". 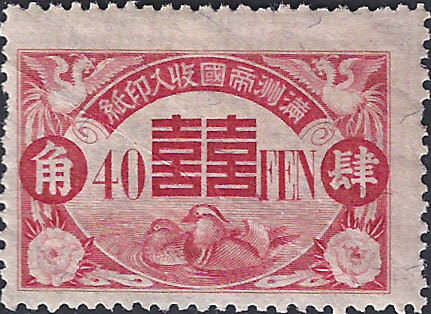 The heading now reads 滿州帝國雙喜印花 Empire of Manchukuo double happiness stamp. Note that the imperial Phoenix now replaces the chrysanthemum design in the top two corners. 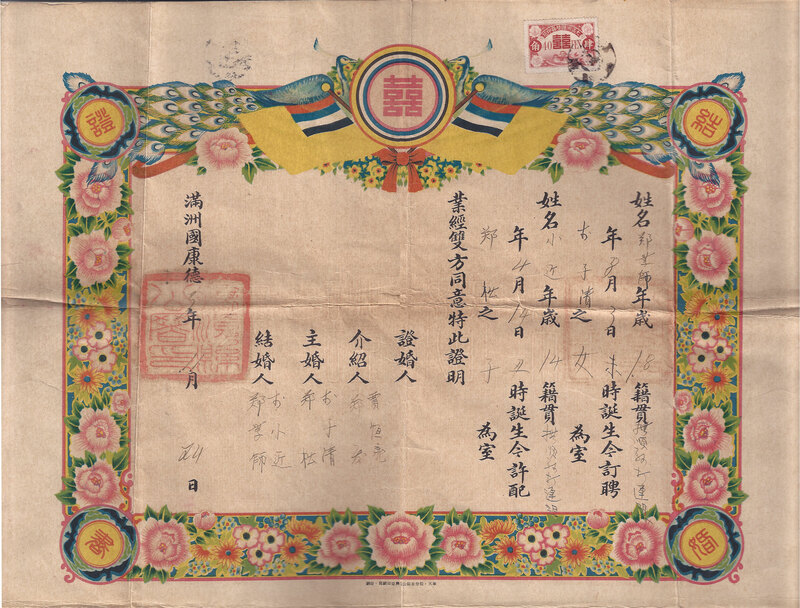 The stamps were engraved on watermarked (see below) "granite" paper and going by the watermark and paper the likely printers are the Central Bank of Manchukuo Printing Department in Hsinking. Perf 13½ x 13. Size 31.5mm x 21.5mm. Litho printed on granite, watermarked paper. 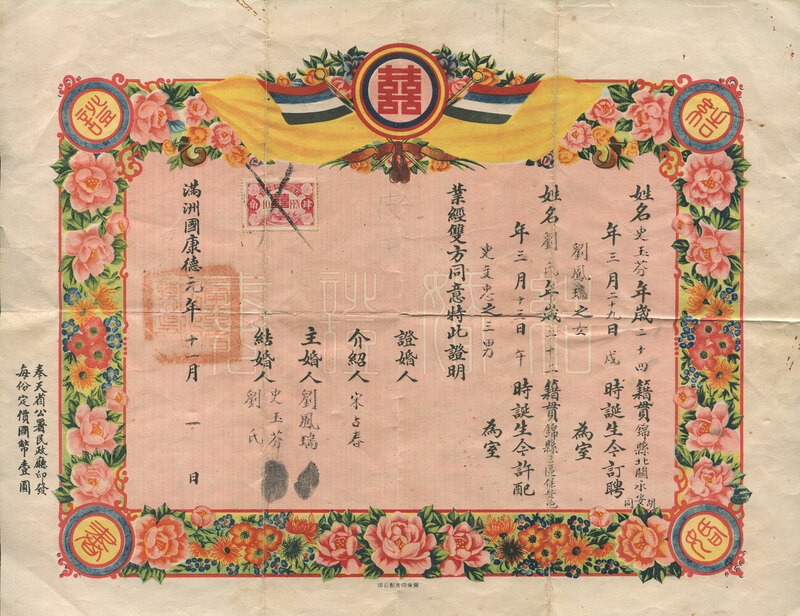 Unused Manchukuo Betrothal Certificate from the Kangde period. It is not known if any revenue stamps were used in connection with this or if they had any legality. From research these certificates seem to be more ceremonial in function. Matchmakers employed by the parents would find a suitable match, if all went well certificates would be exchanged and the couple betrothed. A green certificate for a girl and a red certificate for a boy. In this instance the certificate is green so it is likely that a girl would have exchanged this with her fiancé. 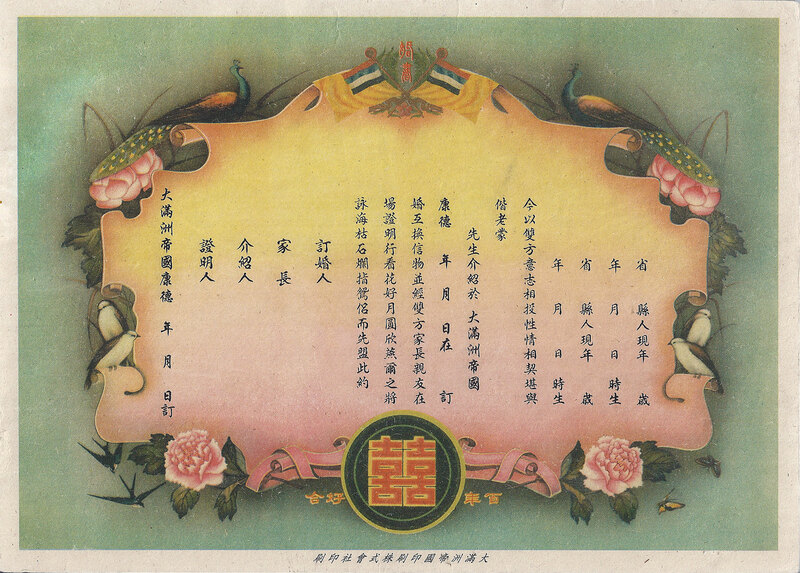 The certificate shows the dates of birth of each of the couple.